SSC CHSL Exam Syllabus 2018: Hi Friends are you looking for the news Examination Syllabus for the SSC Combined Higher Secondary Level (CHSL) 2018 Syllabus. 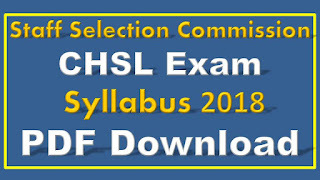 Yes in this post giving the information of the LDC Clerk Syllabus, SSC CHSL Selection Process, and SSC CHSL Old Paper PDF Download files below attachment the links. Maximum number of candidates is applied for this SSC LDC Clerk, Postal Sorting Assistant, and Data Entry Operator (DEO). Staff Selection Commission Recruitment Board has decided the Conducted the Online Computer based test for all applied Aspirants at different examination centers in all over India. Now all applied students are starting their preparation for Online CBT Test. First Of All Candidates Should Know the Complete Detailed Syllabus useful for Fast Preparation. 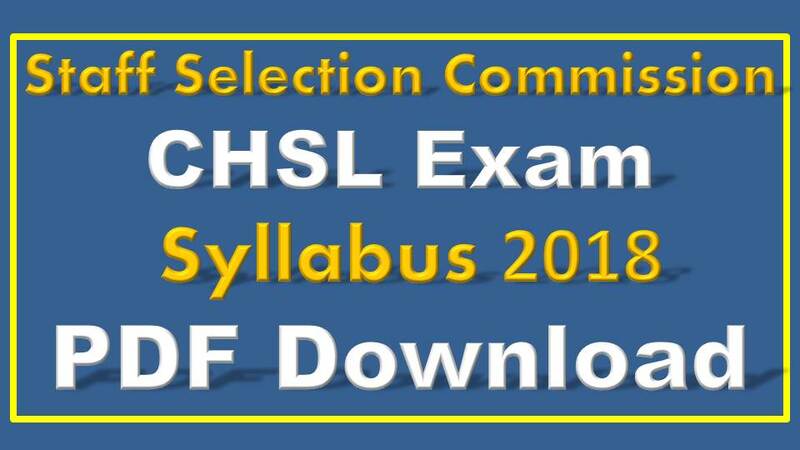 Each and every applied person download the SSC CHSL Exam Syllabus PDF 2018 below enclosed the links. All Over India Large Number of Students is eagerly waiting for the SSC Recruitment Notification 2018. At Present SSC Board invite the application for filling the CHSL post in Different Categories like as Lower Division Clerk (LDC), Data Entry operator (DEO), and Postal Sorting Assistant (PSA). More Than 3200 Posts are filling in this year SSC CHSL Notification 2018. It is a good opportunity to get the central government job with a proper preparation. Our team gives some important tips and How to Crack SSC CHSL in First Attempt follow the tips useful when examination time. SSC Recruitment Board has given in the official notification the selection process for the SSC CHSL 2018 having following test. Each wrong answer penalty of 1/4th (0.25) marks. Time Duration for written test is 60 minutes (1hour).